Santa Ponsa is a favourite holiday destination for many, and is located in a sheltered cove on the stunning south-west coast of Majorca. Visitors tend to spend their holiday staying in the beautiful villas in the nearby countryside. 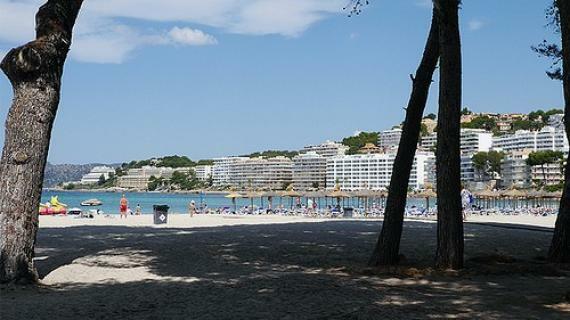 Santa Ponsa's beach of soft white sand and clear blue sea is a popular place for its visitors. Port Adriano, a new deep water harbour, is there to accommodate the yachts of the rich and famous. The huge Festival of the Rei en Jaume at the end of summer celebrates the landing of Jaume the first in 1229 when he began his conquest of Majorca. Santa Ponsa is known for its stunning, idyllic beaches. Visitors to the resort have 3 lovely beaches to choose from, 'Santa Ponsa Beach', 'Little Beach' and 'Castellot Beach'. Santa Ponsa Beach is the main beach in the resort and has a promenade that features bars, restaurants and coffee & snack shops. This beach is perfect for the adventure-lovers because there is a variety of activities available to take part in, including jet-skiing, paragliding, pedal boats, banana boats and boat trips. Little Beach is around a 15-minute walk away, and its name certainly gives away its size! For those visitors looking for a little less hustle & bustle and a bit more privacy, Little Beach is the best choice. Finally, Castellot Beach is a small, rocky beach located to the north of Santa Ponsa's centre. For those with a love of nature and exploring, a day spent here will be an interesting one indeed. For an unusual adventure between April and November, it's a great idea to head to Jungle Parc, the Balearic Islands' only acrobatic tree circuit. Situated in a 9 hectare forest, there are three levels of heights above the ground with 100 platforms. The activities involve moving from tree to tree using rope swings, vines, nets, zip wires and bridges. The two adult circuits are known as 'Explorer' and 'Extreme'. There's also a special Pirates circuit for children aged four years and above. Detailed instructions are given, and there is always a trial run beforehand. Santa Ponsa itself does not have any water parks, but close by, in Maguluf, is the Western Water Park. A visit to this fun-filled aqua park is great for the whole family. The nightlife of Santa Ponsa is known to be on the diverse side, and is much more relaxed than Magaluf's party scene. For a little daytime entertainment when visitors aren't sunning themselves on the beach, Santa Ponsa has a selection of amazing shops. If you're into flea markets, there is one taking place every Saturday in one of Santa Ponsa's local areas, Son Bugadellas. Here, you can find very old and interesting objects for a reasonable price. Santa Ponsa is easy to reach by car, and there are also several buses that travel from Palma City Centre to Santa Ponsa. Find information about selected Hotels, apartments and rooms in Santa Ponsa to choose the perfect place for your accommodation.